The following was from a Laurel press release. 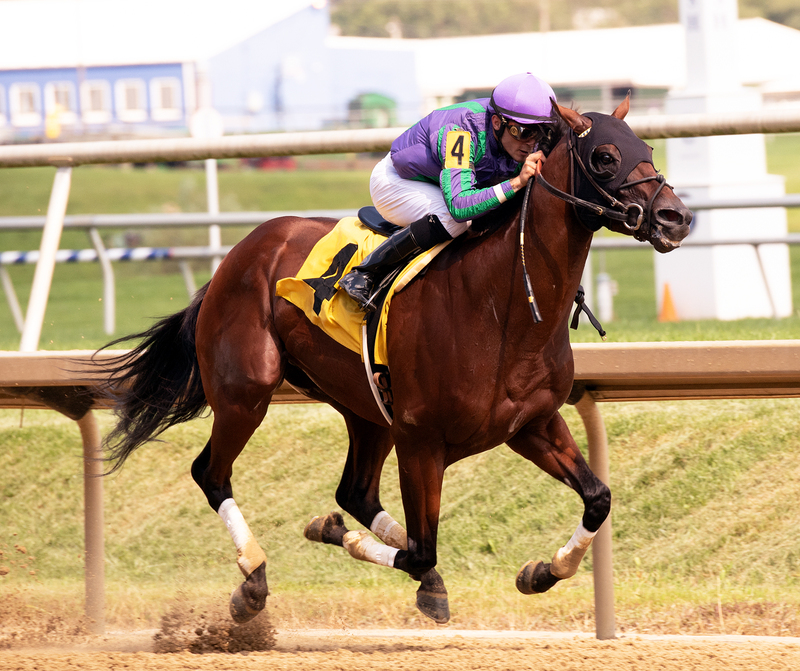 LAUREL, MD – Morgans Ford Farm homebred River Deep, unsuccessful in four tries since ending 2017 on a four-race win streak, made an emphatic return to that late-season form with a dominating 7 ¼-length victory in Saturday’s $75,000 Hansel Stakes at Laurel Park. The Hansel and the $75,000 Meadow Stable at 5 ½ furlongs, both for 3-year-olds and up, were among four stakes worth $300,000 in purses for Virginia-bred/sired horses on the 10-race Commonwealth Day program. Heavy overnight rain forced all four stakes to be moved off Laurel’s world-class turf course to a fast main track. River Deep ($3.60), favored at 4-5 a field of six, ran one mile in 1:36.68. River Deep broke sharpest of all and was quickly in front under jockey Sheldon Russell, going in 24.42 seconds for the first quarter-mile and 48.27 for the half pressed by Carbon Data, who set the pace before tiring to fifth in the first leg of the Virginia-bred/sired series, the one-mile Edward Evans on turf June 23. 2018 Hansel Stakes winner River Deep is shown in the winners circle at Laurel August 4th. Photo by Jim McCue. 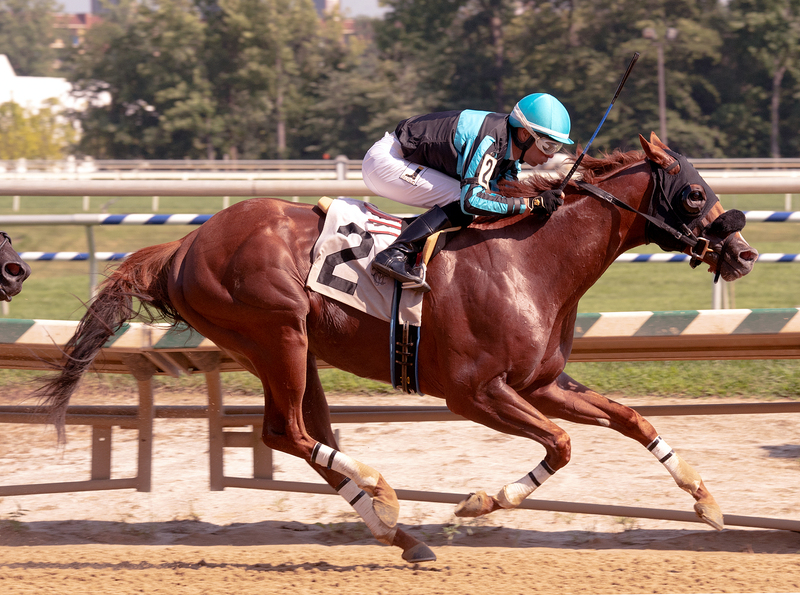 A 4-year-old son of Arch, River Deep remained in command after going six furlongs in 1:12.71 and, once straightened for home, put his rivals away with a powerful run through the stretch. Carbon Data was a clear second, 5 ¼ lengths in front of Jump Ship, followed by Speed Gracer, Whiskey Wu and Officer’s Oath. Special Envoy, the defending champion and 3-5 program favorite, was scratched. Pressed from the outset by top choices Determined Vision and Fly E Dubai, Tag Stables and Bedlam’s Homespun Hero dug in along the inside and fended off both horses the length of the stretch to win the $75,000 Meadow Stable Stakes. It was the first win in 14 starts dating back to March of 2017 for Homespun Hero ($10), who completed a stakes double for jockey Daniel Centeno, winner of the $75,000 William M. Backer aboard Paulita three races earlier. Homespun Hero was best in an exciting four horse field August 4th in the Meadow Stable Stakes. photo courtesy of Jim McCue. 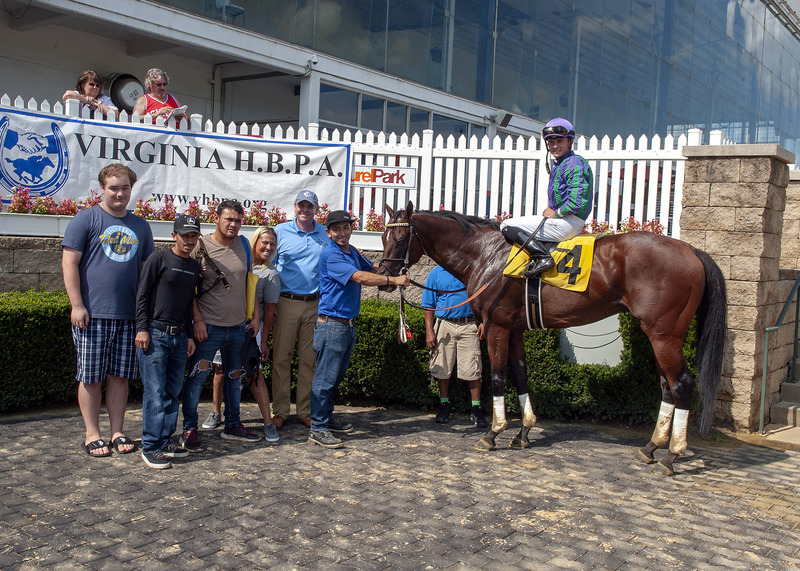 Homespun Hero, fifth by 1 ½ lengths in the 5 ½-furlong White Oak Farm for Virginia-bred/sired horses over the Laurel turf June 23, and Determined Vision dueled for the lead as the first quarter-mile went in 22.49 seconds. Even-money favorite Determined Vision, racing two wide, put a nose in front on the turn but Homespun Hero reestablished his advantage after a half in 45.80. 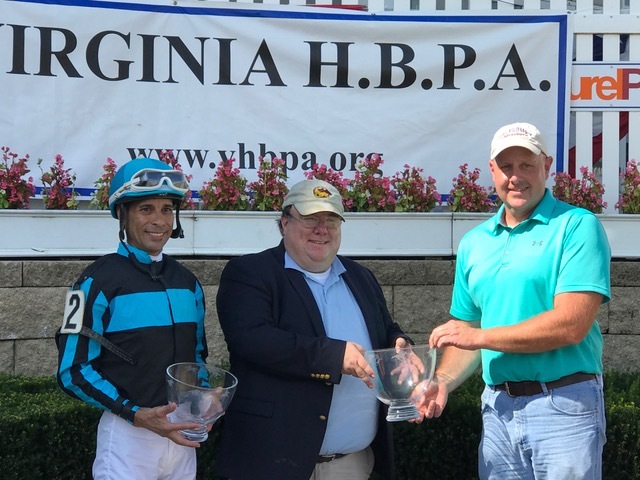 Homespun Hero’s connections — jockey Daniel Centeno and trainer Mark Shuman accept the Meadow Stables Stakes trophy from VTA Board member Jim Arrison. Fly E Dubai swept to the outside to join the leaders and make it a three-horse race at the top of the stretch, but Homespun Hero would not waver after going five furlongs in 57.69 seconds, completing 5 ½ furlongs in 1:03.39 to win by a length. Determined Vision was second with Fly E Dubai another 2 ½ lengths back in third.